When you think of EAI or Enterprise Application Integration, on a scale of 1 to 10, how daunting does it sound? How did it come up in the equation? Why is it actually necessary to implement Enterprise Application Integration for your organization? And the most important of it all, what are the larger benefits for an organization looking forward to EAI? 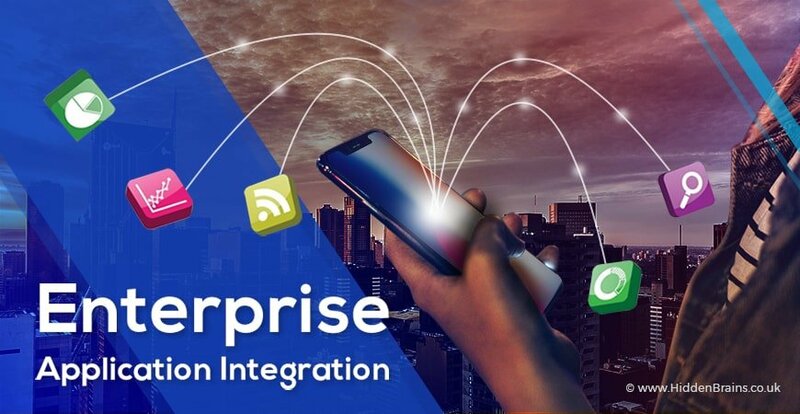 Enterprise Application Integration might not be the most exciting terminology in today’s world or Enterprise Web Application Development company might not be the company your organization is eager to partner with immediately. Just hold on to the upcoming facts and by the time you finish reading this article, you definitely might want to rethink about this aforementioned stodgy but definitely inevitable vertical. Think of it: Currently we are in the middle of technological tornado. Forget the category–F3, F4, F5 sounds trivial in front of this tornado we are talking about. This is an F21 category tornado. The 21st century tornado, swirling at speeds unsurmountable. It is gaining momentum exponentially and with each passing minute, its height and breadth increases by two folds. You are at the eye of the tornado. Unaffected, untouched and inert. The vortex is around you; expanding and gaining the impetus as you just stand there and watch the ongoing transformation. What is the origin of this tornado? Simple answer: Internet. Complex answer: Evolution. Everything that you have ever heard of in the world of tech, every new advancement, every emerging technology is there, spinning and growing endlessly. Fueling the tornado as it moves ahead. Look closely and you will be able to see that at the root of the vortex lies the technologies which are in the maturing stage. Important technologies that laid the foundation of this tornado. A tornado capable of bringing the required transformation. Side note:- Once this tornado settles down, once it starts losing its momentum and once the dust settles down–which eventually will by the laws of nature, the world around us will not be the same. We would have been teleported into another dimension; the age of Technium. Coming back to the topic, let’s have a look at the image again. Smartphone devices, mobile applications, social media and digital platforms, and Enterprise systems are some of the technologies which are on their way to maturity. We have achieved the agility required to master these technologies. Meanwhile, Big Data, Automation, Cloud Computing, and IoT are at the intersection of emerging and maturing stages. Talking about maturing technologies and agile methodologies, here we have our topic for today- Enterprise Systems. Since we had promised ourselves to keep things simple and less boring, we will start with understanding what are enterprise systems down to the most simple form. Enterprise System:- A package of application softwares that helps run the complex processes in an organization. All business processes, information flows, reporting, data analytics etc are managed seamlessly with the help of enterprise systems. As uncomplicated as it can get, right? Let’s look at some of the examples. While the winds are churning faster than ever, we will take a moment out to focus deeper into the Enterprise systems. Let us zoom in. ERP- Think of Microsoft’s Excel, Word, and Powerpoint. These are its various business functions. Combine them together into one package and it becomes MS Office which is ERP system. These applications have been developed by Microsoft for large-scale use in enterprises. Similarly today, you can a get a customized software developed, the one which suits your business requirements, from an enterprise web application development company. CRM- CRM and ERP are quite similar. The only difference being that CRM is more focused towards customer management. Customer data such as sales, purchase, customer information etc are store in it and can be later used by the sales team for predictive analysis. SCM- Imagine a bag of chips we casually gobble down. The units that pluck out the potatoes, departments that sort, wash and pick them for the final process, the manufacturing unit, the transportation which delivers the cartons to various stores etc all have to work seamlessly in order for you to enjoy the bag of chips. Software packages are installed across integrated hardware devices for smooth functioning. While we were busy focusing inside the enterprise systems, the vortex around us grew larger. The technologies grew better and bolder. Cherry picking the vital aspects from other technologies, the ecosystem started developing or should we say the tornado started gaining momentum. So, we are very clear about the term Enterprise systems now. We also understand why this term must have been coined. Why companies must have looked forward to enterprise systems. Let’s say, you run a large organization. With more than 700 employees, your company manages product manufacturing, marketing, sales, shipping, and after-sales. Also, your company has a corporate office which manages other verticals like customer service, after sales, website and application maintenance etc remotely. The configuration and operation of the technology function in your organization is driven by the Technology Operation Model or TOM. Before this becomes another mundane terminology, let me break this down. The technology operation model is nothing but choices that an organization makes in order to succeed. Pretty simple. What does TOM comprise of? Infrastructure- The servers, mainframe systems, desktop and laptop systems, mobile devices- all of these form the IT infrastructure of your organization. A large enterprise relies heavily on them and without them a company cannot function. Can it get any simpler? Processes Automation- What would be the scenario if every lead that your company receives is added manually into the system by a designated team? Imagine updating the list of inventory on the PC from a sheet of paper. How about calling up the customer to check whether they have received their desired order before you can update the database manually? And add to that thousands of such customers. Hence, automation. Systems Integration- All the device in your organization are connected. The servers are connected to the desktops. The mainframe is connected to the servers. Right, that was easy to understand. Now, an enterprise web application development company helps these organizations develop a software based on their process and requirements. Here, take an example. A telecommunication service provider may have a software which has all of their customer’s profile added into it. Customer’s entire history with the company, their mobile and data usage, access to barring or activating a customer’s call and data services, payment processing and everything under the sun that helps run a customer’s profile. A customer went into the physical store of the telecom company and bought a new SIM card. The customer requested activation after submitting the documents. The executive at POS uploaded the documents online on their software. Created a new customer profile on their system and added a comment to activate the SIM after verification. Online executive, located a thousand mile away from the store got a notification on her system while she was logged in into the software. She scanned the documents and activated the new customer’s profile and number; while working on the software. A log of customer’s name, address, new mobile number, date, place and time of purchase etc is created into the system. This information can now be accessed by the company employees citing level access. But remember, a telecom company serving an entire country has employees spread across the globe. Each one of them access the software in different time-zone. And, depending upon the nature of work, multiple employees edit the information on a daily basis. While the software in reference is undoubtedly accessed from the cloud today, the real-time updates and changes which are reflected on each and every system accessing the software is what we call Enterprise Application Integration. Each and every device accessing the company’s application has to be in constant contact with each other. The application should be able to communicate with all compatible devices seamlessly. That is when Enterprise Application Integration comes in. As we discussed, applications are directly uploaded to cloud and accessed from there. Maintaining in-house servers is a trend long forgotten. Companies simply cannot afford to house their own servers when cloud based services are at par. Just a few years back, the only devices that would run the software were workstations or traditional desktops. With smartphones becoming mainstream, application integration is now more focused on driving reports and analysis through mobile devices. Cloud services are at the center stage of organizational evolution. With increased adoption of cloud services, the platforms are evolving into vast complex systems. Each organization has its own set of unique requirements that align with their business. In order to satiate the growing complexity and provide bespoke cloud solutions, companies are offering Integration Platform as a Service. BYOD is now encouraged across various organizations. By implementing Bring Your Own Device policy, companies are able to reduce cost and drive qualitative results. Application integration is now heavily focused on employee’s own device which require additional security and data protection. Once a business becomes scalable enough, application integration becomes a vital part. We can safely conclude, Enterprise Application Integration or EAI or Enterprise Systems or Application Integration has its roots deep into the world of technical evolution and is fueling the vortex.